Wall Street Journal – Farmland: The Next Boom? Is farmland going to be the next gold? It isn’t as implausible as it may sound. Forecasts are always a sucker’s game, but there are good reasons why the next few decades could see a new boom in farm country—and big money for those who own the land. Demand for food is soaring. The world has consumed more food than it has produced in nine of the past 10 years, Susan Payne, chief executive of agricultural investment firm Emergent Asset Management, told the World Agricultural Investment Conference in London this week. Population is rising fast; another billion mouths to feed will probably be added in just in the next 15 years. And as the developed countries get richer, they want to eat more meat and dairy products. The Chinese eat about four times as much meat per person as they did in the 1980s, says Ms. Payne. These are intensive products. It takes seven pounds of grain to produce one pound of beef. SG Securities estimates that demand for grain alone will rise by 50% to 100% over the next 40 years. We’ve already seen trouble. There were food riots in some countries two years ago. Wheat, coffee and sugar prices have rocketed this summer. Canaries in the coal mine? “We expect to see a resource war around 2020,” says Ms. Payne. 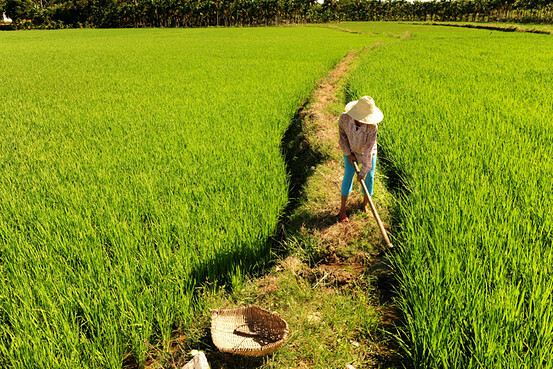 A worker irrigates a field in China’s Hainan Province in July. They’re not making any more land. Indeed, they’re taking some of it away. A lot is being appropriated for cities, factories and shopping malls. We are losing yet more to soil erosion, salinization, overexploitation and desertification. Climate change is having an effect. Charmion McBride, head of agriculture for Insight Investment, says the amount of arable land per person on the planet has halved in about 40 years. Emmanuel Jayet, head of agricultural commodities research at SG Securities, says there are still 450 million additional hectares that the world could farm. Yet most of them are in sub-Saharan Africa and Latin America, where infrastructure—and political stability—have sometimes left something to be desired. The picture is similar when it comes to food from the seas. The world’s wild fisheries are overfished, perhaps terminally so. There is a big push to expand fish farms. That is one solution, but hardly a sufficient one. Meanwhile, investor interest in land, and in agriculture generally, is decidedly low. This week’s World Agriculture Investment Conference attracted much fewer than 100 people. One attendee I spoke to said this was an improvement: A few years ago no one was interested at all. It’s seen as an asset class that is simultaneously dangerously unusual and absolutely tedious. Several people in finance, when I explained where I was going, affected a sudden attack of narcolepsy. Some institutions are starting to take an interest, but the numbers involved are comparatively small—$200 million here, $50 million there. The Chinese, notably, are active around the world, buying land and investing in projects. That may be a harbinger of something. If overall investor interest is low, the asset class nonetheless has a pedigree. Scarlett O’Hara’s father was on to something: Land has proven a decent investment over long periods. Shonda Warner, chief executive of Chess Ag Full Harvest Partners, a farmland investment fund with about $60 million in assets, calculates that U.S. farmland has produced an average return of 11.6% a year since 1951. That includes income and capital gains. U.S. stocks—as measured by the Standard & Poor’s 500 index—have produced 11.8%. And land has produced those gains with half the volatility of the stock market. Famously, land has also proven a terrific hedge against inflation. It has boomed when prices skyrocketed—such as during the two world wars, and the 1970s. There is a serious risk that we will see a surge in inflation down the road: You could argue the governments need it. No wonder investors have been bidding up the prices of other inflation hedges, such as gold and inflation-protected bonds. Why not land? Typically, investment assets in the U.S. are more expensive than their counterparts overseas. But not when it comes to land. Insight Investment’s Ms. McBride says U.S. farmland is well down the global table in price per hectare. Average prices are about $5,000 per hectare. In Europe they can sometimes go as high as $24,000. U.S. prices are closer to those of lesser-developed countries. One reason? We have so much of it. Among big countries, America, unusually, also has far more arable land than it needs to feed its own population. Investors have been bidding up some prices, but mainly in certain areas of the Midwest, such as Iowa. Chess Ag’s Ms. Warner says the best deals are elsewhere—in places such as Texas, Mississippi, Idaho and the Dakotas. Institutions and even rich individuals with, say, half a million dollars to invest now have their pick of specialized funds investing in farmland and agricultural projects here and overseas. What ordinary investors could really use is a good real-estate Investment trust that invests in farmland. A few are in the works: Stay tuned.